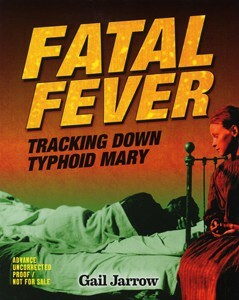 As a child I first heard the term “Typhoid Mary” as a term, not a person, and did not think much more about it until I read Fatal Fever: Tracking Down Typhoid Mary by Gail Jarrow. The author provides clear and concise information about the disease and how it is spread. She then focuses on Mary Mallon and the effort that went into identifying and locating her. The author gives a brief history of typhoid fever, noting that is has been around since prehistoric times. Then she brings the reader to January of 1903 in Ithaca, New York, where typhoid fever infected a number of local citizens as well as Cornell University students. The author tells of the disease, how it was transmitted, and efforts to reduce the possibility of contracting it. The New York State Commissioner of Health contacted George Soper, a sanitary engineer, who had helped Galveston, Texas deal with sanitation issues and disease following a deadly hurricane. The clean-up of the wells, cesspools and outhouses in Ithaca, along with the installation of a filtration system took several months. Determined to prevent future outbreaks Soper was soon on the trail of one individual he felt was responsible for spreading the disease in 1906 and beyond. His efforts, along with assistance from others, and Mary Mallon’s viewpoint that she was being harassed for no reason, are documented throughout the rest of the book. Mary continued to assert she had never contracted typhoid fever and thus could not infect others. Mr. Soper insisted that she must have had a light case that was not diagnosed and continued to carry the disease, his opinion eventually being verified after she was detained and tested. This account reads like a detective novel and a tragedy. One person feeling persecuted and other people suffering from a terrible disease. Reading this put in my mind a real person who was appalled when the name “Typhoid Mary” first appeared in the newspaper. She had always been honest and worked hard and couldn’t understand why people were so convinced she was spreading disease. The book includes period photographs, posters, cartoons, and newspaper items that convey the living conditions of the time and the suggestions for avoiding disease. Source notes, a bibliography, and an index are also included. This entry was posted in Books & Reading and tagged Friday Reads. Bookmark the permalink.